Well, the premiere of DC’s newest television adaption has come and gone, and it went by quite quickly. Yep, now that I’ve gotten past an obligatory reference to the concept of “fastness,” I can delve into the contents of the episode itself. First, I should let you know that I’ve never seen an episode of Arrow, the show from which the CW’s The Flash spun-off. Really, I’ve grown somewhat cynical to investing time in shows with large episode orders, and I’ve always had a slight aversion to anything on the CW. I always expect its shows to contain drawn-out love triangles and squares to pad episode times and half-heartedly create both tension and romance. I also expect its actors to be somewhere between the ages of 16 and 29, and brooding while they think about their good looks. So imagine my surprise when the first episode of The Flash destroyed all of my preconceived notions. Immediately, the show begins with a voice-over which wastes no time filling us in on who exactly Grant Gustin’s Barry Allen is. The color pallete of the show is strikingly bright, emphasizing the show’s optimistic outlook and generally fun tone. The whole hour was a fun, relieving departure from the grittiness of other recent superhero adaptions. Barry and his kind-of-sister Iris West smile and make jokes – their relationship never seems fake or cheesy. I also want to point out that, in all my years of watching television, I’ve not seen a more believable portrayal of police in the medium. Only The Wire and Breaking Bad beat The Flash on this front, but then again, that’s a large part of those shows, which are completely different than this show in, well, pretty much every way. The police force, which we largely see through the eyes of Barry’s adoptive father, Detective Joe West, genuinely seems competent yet prone to mistakes, helpful to its community, and not corrupt. Maybe I’m reading too much into this, but I appreciated it nonetheless, especially since DC’s other newest adaption, Gotham, seems to revel in the hilarious level of corruption it displays. I don’t know, I found it refreshing to see a police force portrayed well. Now, since that last paragraph concerned something that exists in the real world, let’s dive into the more comic-book-y aspects. As we all know, The Flash is fast. So naturally, the big question going into this show would be: Is the super-speed portrayed well? Thankfully, the answer is yes. 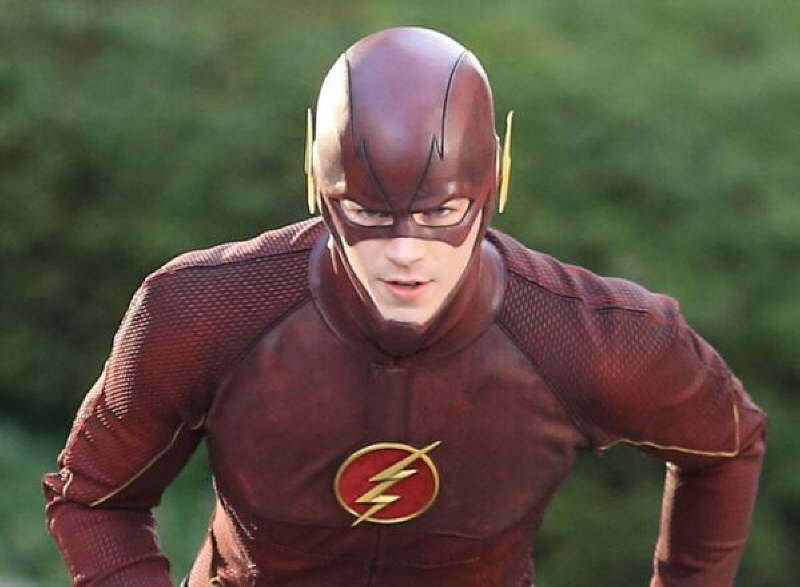 Sometimes, we see Barry moving as a red lightning streak across the screen. Sometimes, we see him in the forefront while everything else moves slowly behind him – not unlike the Quicksilver sequence in this summer’s X-Men: Days of Future Past. The central villain of this episode, Clyde Mardon, controls the weather. Naturally, one would worry that this type of power would look really fake on television, but somehow, once again, they pulled it off. Now, this take on Weather Wizard is hardly the only comic villain present in the show’s world. The past murder of Barry’s mother is brought up multiple times throughout the episode. Clearly, Henry Allen, Barry’s father, didn’t actually do it. When she dies, she is surrounded by a lighting ball eerily similar to those created by Barry’s speed. Fans of the comics will no doubt catch a quick glimpse of the true culprit, and yes, the show absolutely nailed his signature evil grin/smirk/unsettling facial expression. 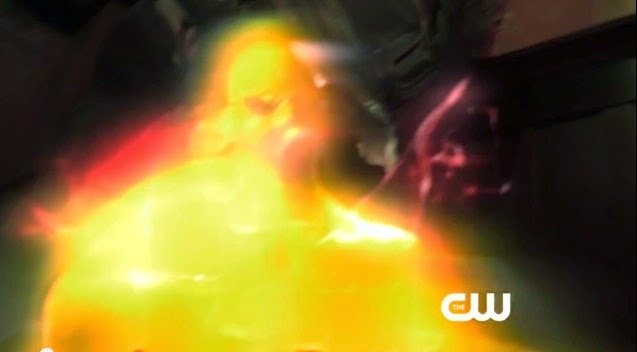 Also, in a not-so-subtle nod, the show seemingly sets up one of The Flash’s most famous foes. Be on the lookout for a cage with a sign. I’m more than curious to see how a TV show manages this harry feat. Who is the man that killed Barry’s mom? Ultimately, I won’t give this episode a star rating. Instead, I simply recommend that you watch it. Even if you never watch the subsequent episodes, this hour functions as a fun, mini-movie that has a beginning, middle, and end. It takes all of the good elements from the original Sam Raimi Spiderman adaption, and uses them to its advantage. Seriously, I was smiling while watching this. It builds its world well, it’s shot well, and it’s acted well. What more could you ask for from a pilot? After all, even good shows usually stumble through their first episode. Now, if you are so inclined to expose yourself to spoilers, I will jot down the references and DC nods I caught in my one viewing. Perhaps I missed some. If so, feel free to tell us in the comments. As discussed in the review, Barry’s mother is killed by someone mysterious…look at the color schemes for a big hint. The cage and sign belong to none other than Gorilla Grodd. How the show plans to believably depict a warlord Gorilla is beyond me. Barry tested his speed at a Ferris Aircraft runway. Apparently elements of the Green Lantern world exist in this universe. Danielle Panabaker’s character, Dr. Caitlin Snow, should sound familiar. She could turn quite cold in the future. Similarly, Carlos Valdes’ Cisco Ramon could continue to have chill vibes. Mardon is shot, but we never see where the bullet hits, so Weather Wizard is almost definitely coming back.